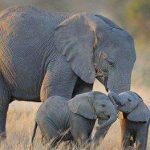 There are two species of elephants, African and Asian, and while they are similar in physiology, they are too biologically different to interbreed. 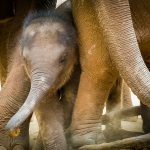 In a further corroboration that African elephants are comprised of two different species (forest and savannah), a new scientific finding discloses that ancient giant elephants living 1.5 million to 100,000 years ago across Eurasia (before eventually becoming extinct) are more closely related to the African forest elephants of today than the forest elephants are related to African savannah elephants! Prior to this finding, most experts agreed that the ancient species of giant elephant was most closely linked to the Asian elephant. Recent scientific findings suggest that the forest-dwelling African elephant is a genetically distinct species, making it a third elephant species. The Asian elephant is endangered with less than 40,000 remaining worldwide. 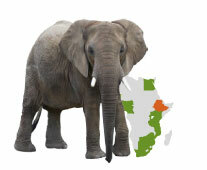 The African elephant (Forest and Savannah) is threatened with less than 400,000 remaining worldwide. 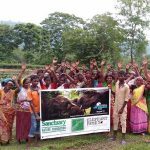 Asian elephants range in 13 countries. In the past 50 years, the Asian elephant range has shrunk by over 70%. In Asia there are approximately 70,000 people to 1 elephant across their range. There were over 100,000 elephants in Thailand at the beginning of last century. There are less than 4,000 today.